Allison Paving has been providing unique block paving and draining solutions for over 30 years and this reputation for excellence continues to this present day. 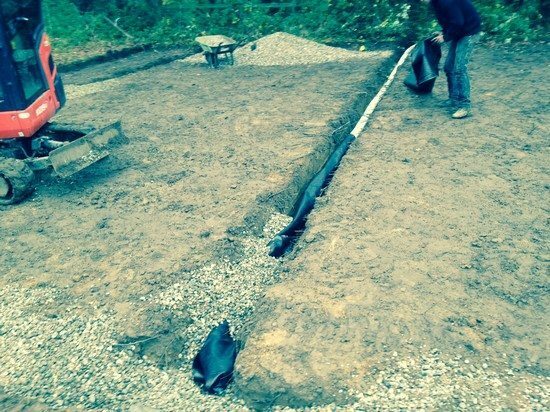 While our expertise includes fencing, landscaping, driveway sealing and decking, we can also offer bespoke drainage solutions revolving around block paving. Let us take a more in-depth look at what customers can expect when working with our team. Block paving is a popular option due to its aesthetic appeal and durability. However, it is often what occurs “behind the scenes” that makes the difference between a successful project and one which will require an undue amount of costly maintenance in the future. Drainage is a key concern. Before we undertake any project, our team will perform a thorough on-site survey in order to determine such factors as the type of soil, the underlying slope and which methods will best serve to prevent any excess water from pooling. Once we have a thorough understanding of the needs of a specific property, the real work will begin. In terms of effective water drainage, the foundation gradient is exceedingly important, for determining the correct angle will prevent water from pooling both above and below the blocks themselves. All plans are supplied to the customer in advance to make certain that he or she does not have any additional questions. Please note that this is only a very general list and the solutions provided by Allison Paving will naturally revolve around the location in question. There can also be times when gullies or other accessories are put into place in order to lessen the chances of water accumulating during heavy rain events. We are so confident in the results of this approach that we are pleased to offer a five-year guarantee in the event that any issues or problems “come to the surface”. We plan everything down to the finest detail and we will offer some of the most competitive rates in the industry. In order to learn more or to schedule an on-site consultation, please do not hesitate to contact us at your convenience. Allison Paving has taken the guesswork out of bespoke block paving drainage solutions.